While contemporary vessels lack the open hatch grates of 19th century sailing ships, boaters still know what it means to “batten down the hatches” in preparation for a storm. Eliminating or minimizing vulnerabilities before rough conditions hit is also becoming an essential consideration for marina owners and operators. Coastal and shoreline areas occupy ground zero for a broad range of climate change impacts, exposing a widening number of hatches that will need to be battened down or rebuilt in the years ahead. The creation of more adaptive and resilient marina facilities has major implications for the future of the recreational boating industry. At the same time the industry is facing major shifts in its markets, user demographics and the adoption of new technology, it is also confronting an increase in marina operational risks and disruptive impacts. All these changes must be anticipated and managed. Several big-picture trends are emerging with significant implications for how the industry will adapt moving forward. Harbor and shore protection systems aren’t typically designed to deal with a surge coming from behind them. Landside flooding represents a growing risk for marinas, especially those located near flashflood-prone rivers and streams. The potential for heavier rainfall is increasing due to climate change. As recent storms have unfortunately shown, the destructive impact of heavier rains continues long after the higher winds and waves have subsided. Hurricane Harvey shattered the U.S. single-storm rainfall record, dropping more than 50 inches on Houston and more than 60 inches on other parts of Texas last year. Subsequent studies attributed this to record warm water temperatures that supercharged the storm’s rain-producing capacity. This year’s Hurricane Florence was a similar slow-moving, supercharged storm. Florence set new rainfall records for North Carolina and produced historic flooding over two weeks after landfall. The resulting damage to and closure of Crosswinds Marina on Jordan Lake, located 170 miles inland from the Atlantic, serves as a managed-flooding case study for other marinas located on dammed lake and river systems. To prevent even worse damage downstream, the Corps of Engineers decided to hold floodwaters in Jordan Lake rather than release them into the swelling Neuse and Cape Fear Rivers. It doesn’t require a hurricane to experience the growing risks posed by heavier rain events. 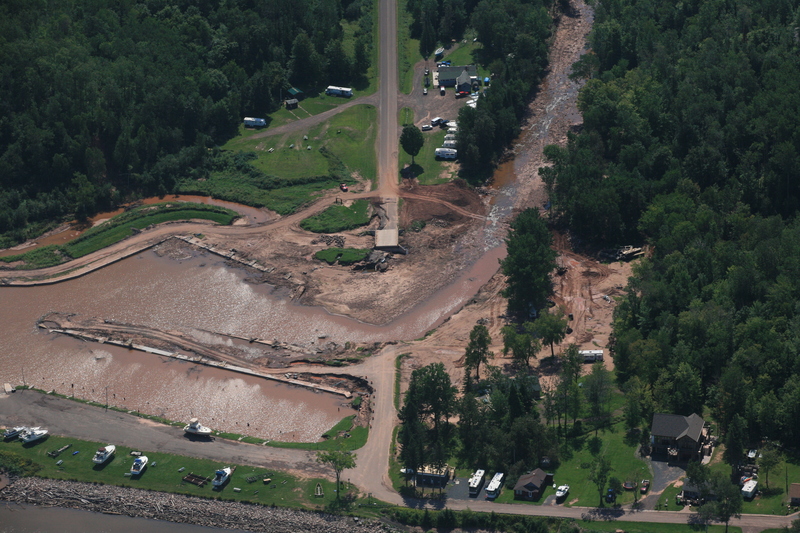 In 2016, Wisconsin’s Saxon Harbor—a marina adjacent to where Parker and Oronto Creeks flow into Lake Superior—got more than a foot of rain in just a few hours. The resulting landside flooding devastated the marina. The projected increase in high-tide flooding from sea-level rise is another concerning trend. High-tide flooding in the U.S. is twice as frequent as 30 years. A 2018 report from the U.S. National Oceanic and Atmospheric Administration predicts that many Atlantic and Gulf Coast communities will experience high-tide flooding every other day by the end of this century. As one NOAA researcher put it, “Today’s flood will become tomorrow’s high tide.” The roads, parking lots and land-based facilities serving coastal marinas in these areas will need to adapt to the gradual onset of this new normal. Many readers likely saw the photo of the single house left standing in an otherwise decimated Mexico Beach neighborhood after Hurricane Michael tore through Florida’s panhandle in October. With its foot-thick concrete walls, 40-foot piling driven deep underground, and a roof held in place by steel cables, this house’s survival was a testament to its fortress-like exceedance of Florida’s building codes. It was also a testament to the owners’ ability to pay significantly more for its construction. More resilient regulations and codes are clearly needed to avoid costly, repetitive cycles of building and rebuilding in flood zones. But stronger structures using better materials will cost more to build, and the implications for the recreational boating industry are clear. Older marinas and facilities that charge lower slip and storage rates could find future insurance and infrastructure upgrade costs pricing them out of their markets. The issue of how to pay for more adaptive and resilient infrastructure is also being grappled with at the federal level. In 2016, President Obama signed Executive Order 13690, establishing higher flood risk mitigation standards for federally funded projects. Two weeks before Hurricane Harvey hit Texas, this executive order was revoked by President Trump as part of a new order to expedite approvals and lower costs for federal infrastructure projects. Congressional action will be required to establish a long-term policy for funding and building more flood-resistant infrastructure moving forward. A recently released study by the Woods Hole Oceanographic Institution found that the frequency and magnitude of Mississippi River floods have increased appreciably over the past 150 years. In analyzing the potential contributing factors, the report’s preliminary conclusion attributes up to 75 percent of this increase to the dams, levees and floodwalls built to control the river and manage its flooding. It is important to recognize that building more of what was built before has the potential to exacerbate rather than minimize risks. Critics have long contended that the Corps’ approach to managing the Mississippi River does not give the river enough places to go during floods. The flooding avoided in one hardened location gets passed downstream, transferring and magnifying rather than solving the problem. Hybrid design blending natural and built systems. The development of softer, bioengineered solutions will continue to grow, along with new cast and pre-cast concrete systems that act as submerged reefs or partially floating barriers to protect the beaches, wetlands and mangrove systems behind them. New policies for adapting natural systems as part of this hybrid design approach will seek to enhance shoreline ecology and flood protection, while also providing carbon absorption benefits. Regional Shoreline Management: More states, counties and municipalities will adopt a regional approach to their coastal resilience issues. Rather than trying to protect themselves one project at a time, they will broker more comprehensive solutions for coastal protection, construction and maintenance that cross multiple jurisdiction and property lines. Dredging and the reuse of dredged sediment will continue to evolve as an integrated part of these regional approaches. Floating and Movable Infrastructure: The ability to move and reconfigure marina infrastructure will become increasingly important, as marinas adapt to changing conditions and water level fluctuations. In addition to more floating marina buildings, there will be new forms of reconfigurable marine infrastructure—some able to move themselves. The Roboat being piloted by the Amsterdam Institute for Advanced Metropolitan Solutions and the Massachusetts Institute of Technology represents what they call “a new kind of on-demand infrastructure.” Its autonomous, smart platforms can be combined to form floating bridges and stages, collect waste, transport passengers and collect data on conditions such as water quality. Mandatory requirements for boat inspection and cleaning continue to expand nationally and internationally, as states and nations work to stem the destructive introduction of new invasive species to their waters. Marinas will be required to play a growing role in the enforcement of these efforts as part of the frontline of defense. New Zealand adopted a new Craft Risk Management Standard in May that requires all vessels entering their territorial waters to undergo an out-of-water hull cleaning at an approved haul-out facility. The Pacific island country of Vanuatu has also banned in-water hull cleaning in their effort to stop invasive species. Australia is expected to follow suit with similar biosecurity policies. California approved a new law in September to expedite mandatory boat inspections for invasive mussels to prevent their spread to critical waterways and reservoirs. First discovered in 2008, zebra and quagga mussels are now in 43 of California’s water bodies. Colorado passed the Mussel-Free Colorado Act last spring, building on Colorado Parks and Wildlife’s Aquatic Nuisance Species inspection and decontamination program introduced 10 years ago. The national and global increase in harmful algal blooms (HABs) represents a serious problem for the recreational boating industry and economies that depend on water-based recreation and tourism. In the most extreme case this year, Florida was hit by two types of HABs: Red Tide and blue-green algae. The toxic Red Tide impacted 125 miles of Florida’s Gulf coastline—causing massive die-offs of fish and marine life and essentially shutting down boating and tourism over July and August. Surveys from Fort Myers (which did not include the largest marinas) reported losses averaging $2.6 million a week for the area’s 376 businesses and $1 million per week in lost salaries. South Florida is also struggling with blue-green algae blooms in its lakes, canals and rivers. While Red Tide is naturally occurring and difficult to predict or control, blue-green algae is largely caused by human activity and is getting worse due to increasing water temperatures. Lake Okeechobee has been especially hard hit by nitrogen and phosphorous-based fertilizer run-off, a situation compounded by the flooding that followed Hurricane Irma. The impacts on human health and local economies have been so severe that Florida state representatives have called for these HABs to be declared and treated as a natural disaster. This issue is growing in national scope and impact. Lincoln Marina on Utah’s largest freshwater lake has had to close repeatedly due to HABs. While Lake Erie is particularly vulnerable to HABs, they are occurring more frequently throughout the Great Lakes watershed. In addition to advocating for better water quality policies, marina owners and operators will need to assess their relative vulnerability and plan for the potential disruption of HABs. Marinas will increasingly need to incorporate emergency and climate action planning into their operational frameworks. Much of this will be driven by insurance considerations, as well as clarifying liability for boat storage or removal during potentially damaging events. But it will also be driven by the growing need to link hazard mitigation and disaster recovery funding with community- and regional-scale risk management efforts. Grants for construction and rebuilding efforts will tend to favor projects advancing larger-scale mitigation benefits. The Gulf of Mexico Alliance’s Clean and Resilient Marinas certification program stands as a marina-industry benchmark in this regard. The program advances resilient and sustainable operational standards as part of a larger regional response to climate change. Clean Marina programs in other parts of the U.S. and other design programs that have historically focused on sustainability will also be adopting new standards incorporating resilience, including the U.S. Green Building Council’s LEED program. These emerging approaches emphasize integration with local emergency and climate action plans, and increased capacity for passive survivability: building in enough back-up power, water, fuel, etc., to recover and remain operational after a disruptive event. Boat US has added a Hurricane Preparation for Marinas and Yacht Clubs section to its website that includes sample preparedness plans: http://www.boatus.com/hurricanes/YCMarinasPrep.asp The site also provides an excellent range of lesson-learned case studies and suggested best practices for weathering severe storms and improving a marina’s resiliency. Foresight remains the key to adaptive and resilient design: building in the capacity to withstand, recover from, and adjust to anticipated shocks and stresses before they occur. Marinas will be particularly well served by battening down their hatches in anticipation of these trends. David Lantz is practice manager for SmithGroup’s Waterfront Practice. He can be contacted at David.Lantz@smithgroup.com.